Bicycle Rongorongo and Moai Rongorongo playing cards inspired by scribes of Easter Island and Polynesian tribal masks. They pay honour to the Rapa Nui civilization of Easter Island. Moai is a monumental statue created by the early Rapa Nui people. Easter Island is famous for its 887 extant moai. 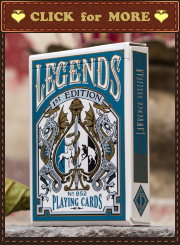 Decks were designed by the American artist, Tomas Leszczynski (New York). They will be produced by his company, Matifu*, and are planned to be printed by the United States Playing Card Company (USPCC). Easter Island is a Polynesian island in the southeastern Pacific Ocean. Today it is a special territory of Chile that was annexed in 1888. UNESCO named Easter Island a World Heritage Site in 1995. It is one of the most remote inhabited islands in the world. It is believed that Polynesian people settled on Easter Island in the first millennium C.E. (A.D.). Nobody knows when exactly they do that as well as how they succeeded in reaching the island. Scholars assume that the settlers found a nice place for living and thriving. The island was covered with forests; volcanic craters were able to collect enough rain water; there were a lot of land birds as well as migratory seabird colonies; its soil was rich for verdant cultivation and waters around it had fish and marine mammals. Archaeological finds prove that they created a flourishing culture. The most visible element in the culture was the production of above-mentioned massive statues called moai. A lot of scholars believe that moai represented deified ancestors. These monolithic human figures were carved from rock. Almost all moai have overly large heads three-eighths the size of the whole statue. The main moai quarry was at Rano Raraku (a volcanic crater formed of consolidated volcanic ash or tuff). Almost half of extant moai are still there. But hundreds were transported from Rano Raraku and set on stone platforms called ahu around the island’s perimeter. The islanders could use wood constructions to do that. By the way, the tallest moai erected, called Paro, was almost 10 metres (33 ft) high and weighed 82 tons! The Polynesian name of the island is Rapa Nui. The name Paasch-Eyland (18th century Dutch for “Easter Island”) was given to it by the Dutch explorer Jacob Roggeveen, who encountered the island on Easter Sunday (April 5, 1722). Nobody knows for sure what happened with this prosperous culture. It is assumed that progress and prosperity of Rapa Nui people lead them to overpopulation, which in turn caused intensive and thoughtless resource consuming. Also active construction of moai could contribute to environmental degradation when extreme deforestation destabilized an already precarious ecosystem. This environmental degradation led to starvation and warfare over limited resources. Many scholars believe that by the time of Jacob’s arrival in 1722, the island’s population had dropped to 2,000 – 3,000 from a high of approximately 15,000 just a century earlier. European exploration and colonization of the island intensified the Rapa Nui civilization’s collapse. The islanders themselves tore down the standing moai after their civilization broke down. As the island became overpopulated and resources diminished, warriors known as matatoa gained more power. The therianthropic figure of a half bird and half man was their symbol. They created the Birdman Cult. Over 480 birdman petroglyphs have been found on the island. The chief god of the Birdman Cult was Make-Make (creator of humanity). This cult maintained that the medium through which the living could contact the dead was no longer statues, but human beings chosen through a ritual. The ritual was an annual competition to collect the first manu tara egg of the season from the islet of Motu Nui, swim back to Rapa Nui and climb the sea cliff of Rano Kau to the cliff top village of Orongo (ceremonial center at the southwestern tip of Rapa Nui). The most unfair thing is that the contestants didn’t actually swim. They appointed a Hopu who would swim to Motu Nui and fetch them the Egg, whilst the contestants waited at Orongo. The race was very dangerous and many Hopu were killed by sharks, drowning or falling. Once the first egg was collected, the final task would be for the unsuccessful Hopu to return to Orongo. The winner was allowed to remain in Motu Nui until he felt spiritually prepared to return. On his return he would present the egg to his patron, who had already shaved his head and painted it either white or red. The successful man (patron) would be declared tangata manu (Birdman). The new Birdman was entitled to gifts of food and other tributes. He went into seclusion for a year in a special ceremonial house. His clan had sole rights to collect that season’s harvest of wild bird eggs and fledglings from Motu Nui. The Birdman cult was suppressed by Christian missionaries in the 1860s. It is unknown whether the cult replaced the preceding Moai-based religion or had co-existed with it. Easter Island once had an apparent script called rongorongo. It is a system of glyphs that include pictographic and geometric shapes. The texts were incised in wood in reverse boustrophedon direction (every other line of writing is flipped or reversed). It was first reported by a French missionary, Eugène Eyraud, in 1864. The Rapa Nui people began to lose the ability to read rongorongo from the 1860s. No inhabitant of Easter Island is able to read it today. This script wasn’t deciphered. There are only different assumptions regarding meanings of the glyphs. 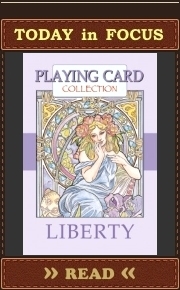 Planned to be printed by the United States Playing Card Company (USPCC). This project will only be funded if at least $13,000 is pledged by Sun, Nov 23 2014. 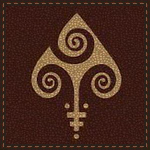 I believe aces are decorated with embellishments that should be common for Polynesian cultures. 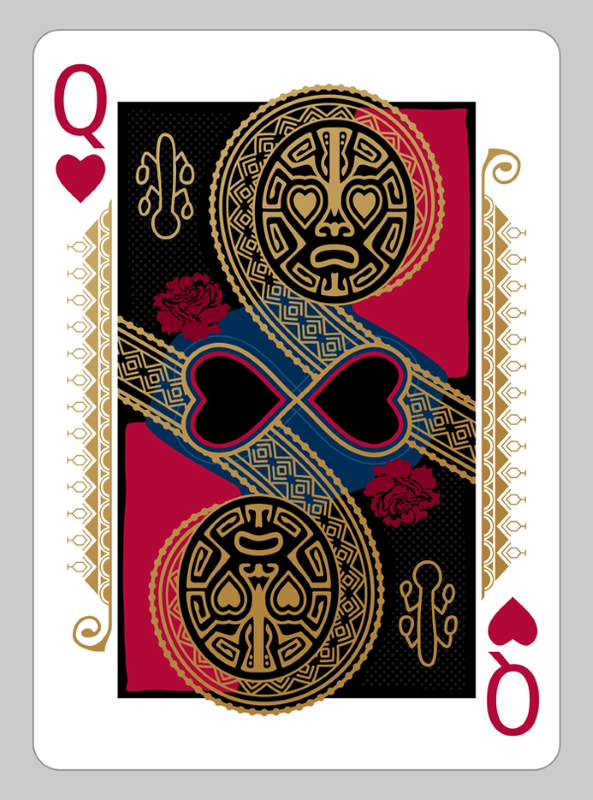 The ace of Spades has also two tribal masks on the main pip. Maybe they are the stylish interpretation of Make-Make’s appearance. Different Polynesian tribal masks are depicted on court cards (Make-Make on the King of Hearts). Ladies are so feminine that they have got flowers to be additionally identified 😉 Men are warriors and have appropriate equipment. Each court card has its own rongorongo glyph. Another interesting and important moment is canoes under indices at the sides of each court card. I don’t know why they have thirteen symbolic sailors. But they pay honour to Polynesian navigation and outrigger canoes, an integral part of such navigation. The outrigger canoe is a type of canoe featuring one or more lateral support floats known as outriggers, which are fastened to one or both sides of the main hull. They were widely used by Polynesian people to sail waters of the Pacific Ocean. How do you think Rapa Nui pioneers were able to get to the island? Polynesian navigation was an interesting system of navigation. It was used to make long voyages across thousands of miles of the open ocean without special navigation kit. Navigators travel to small inhabited islands using only their own senses and knowledge passed by oral tradition from navigator to apprentice, often in the form of song. In order to locate directions at various times of day and year, Polynesian navigators memorize important facts: the motion of specific stars, so where they would rise and set on the horizon of the ocean; weather and the seasons of travel; wildlife species (which gather at particular positions); the direction, size, and speed of ocean waves; colors of the sea and sky, especially how clouds would cluster at the locations of some islands; and angles for approaching harbours. 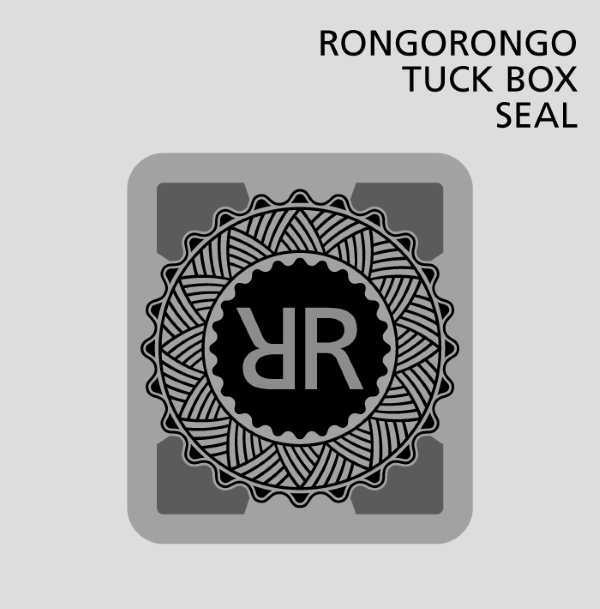 Bicycle Rongorongo Gold Jokers depict two different rongorongo glyphs. Rongorongo (Moai) number cards feature gold Rongorongo glyphs and a large Rongorongo watermark. Backs have birdman petroglyphs as well as different rongorongo glyphs. he fan of backs creates a large image inspired by a symbol of Sun God.